Fellowship in the Alliance of Cardiovascular Professionals recognizes the excellence of credentialed non-physician cardiovascular professionals working in all areas and specialties of cardiac care. 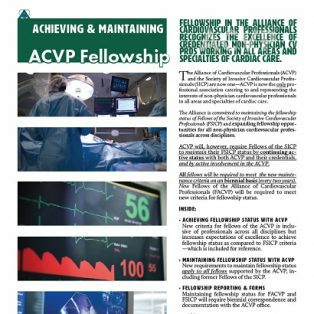 The Alliance is committed to maintaining the fellowship status of Fellows of the Society of Invasive Cardiovascular Professionals (FSICP) and expanding fellowship opportunities for all non-physician cardiovsacular professionals across disciplines. ACVP will, however, require Fellows of the SICP to maintain their FSICP status by continuing active status with both ACVP and their credentials, and by active involvement in the ACVP. All fellows will be required to meet the new maintenance criteria on a biennial basis (every two years). New Fellows of the Alliance of Cardiovascular Professionals (FACVP) will be required to meet new criteria for fellowship status.